…Sunshine and Rain – Annoyingly Boring? My younger son has a warm-up shirt for his basketball team that says “Work Hard Play Hard”. The moment I saw this prompt I thought of that shirt. I was hoping to get home from work in time to have him put it on and go shoot some hoops. By the time I got home it was pitch black. What’s more, once I got home and determined I couldn’t execute the master plan the photo of the day slipped my mind completely. ‘Round comes bed time and I still had nothing. 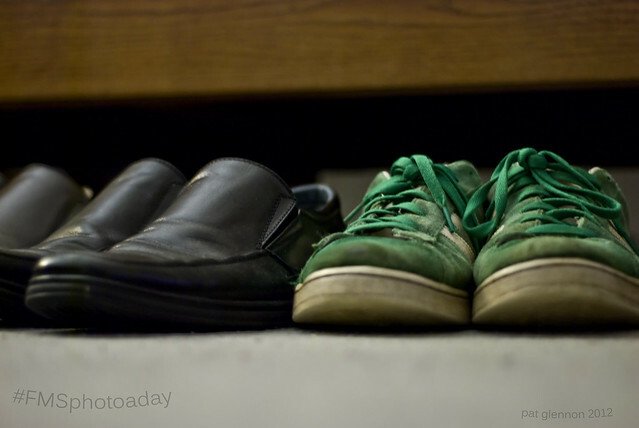 My work shoes and my play shoes fit the bill though as I grabbed a couple quick shots before calling it a day. Pingback: » Clearly Staged (partially) | Annoyingly Boring?